Kathmandu, Oct 5 (IANS) Nepal Prime Minister Sher Bahadur Deuba has consulted lawyers on the status of his government after the country’s major Left political parties, including CPN (Maoist Centre) which is part of the ruling coalition, announced an electoral alliance. He has also sought counsel on the likelihood of a no-confidence motion being filed against the government. Lawyers who met the Prime Minister on Wednesday apprised him of the constitutional and legal provisions relating to the situation and told him that the government would not be affected until the elections, the Kathmandu Post reported. The consultation comes in the wake of the electoral alliance forged among the Communist parties — CPN-UML led by former Prime Minister K.P. Sharma Oli, CPN (Maoist Centre) of former Premier Pushpa Kamal Dahal ‘Prachanda’, and the Naya Shakti Party-Nepal of former Prime Minister Baburam Bhattarai. Among those present during the consultation with Deuba on Wedneday were President of Nepal Bar Association Sher Bahadur KC, General Secretary Khamma Bahadur Khati, and senior advocates Radheshyam Adhikari, Badri Bahadur Karki, Surya Dhungel and Prem Bahadur Khadka. Given that the Maoist Centre is a key stakeholder in the incumbent government led by the Nepali Congress (NC), speculation is rife that the Leftist forces are working to form a new government or change the dynamics of the ruling coalition. A section of NC leaders were of the view that the Maoist Centre should withdraw support from the government and have termed its forging an alliance with the main opposition UML as “unethical”. The UML leaders, however, maintain that the government, led by the NC and the Maoist Centre, is mandated to hold provincial and federal elections scheduled for November 26 and December 7, and that the party is against changing the government before the elections. 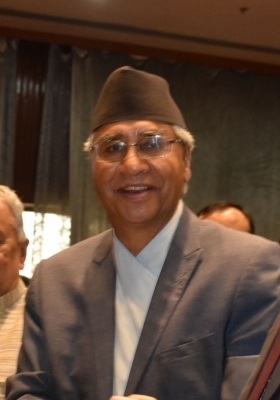 As Prime Minister Deuba held consultations with several key stakeholders, including political parties and legal experts, on Wednesday for charting the future course, the UML urged the government to focus on the upcoming polls. “The government should not divert its attention from the upcoming polls,” UML Vice Chairman Bhim Bahadur Rawal said, addressing a programme in the capital. He clarified that the act of unifying Leftist force had been initiated with a motive to end the tendency of changing governments at short intervals and to maintain political stability. Senior UML leader Subash Chandra Nembang said the party does not see any possibility of change in the power-sharing dynamics with the election code of conduct in force. During the announcement of the Leftist alliance on Tuesday, Maoist Centre Chairman Pushpa Kamal Dahal had renewed his assurance that the current coalition would continue till the elections and that the current bid was a part of the long-term strategy of bringing Left forces together, the Kathmandu Post reported.